The plum site at River Valley have drawn a total of 13 bids, with the top bid of $595.1 million (SGD) or $1,239 psf ppr coming from GuocoLand. The bid has slightly edged past the 2nd highest bid of $588 million (or approximately $1,224 psf ppr) submitted by a 4-way joint consortium formed by Hong Leong Holdings, City Developments Ltd, Garden Estates and TID Residential. Despite a gloomy property market outlook, market watchers believed that both bids have already exceeded the initial expectations of only between $930 and $1,200 psf ppr. It was also noted that the huge interest drawn from property developers may be due to the encouraged performance seen at Cairnhill Nine in recent months. In fact, the top bid by GuocoLand for this land parcel at Martin Place has become the highest ever bid submitted for a Government Land Sales residential site outside of the Sentosa Cove precinct. The last GLS plot sold within the prime district was at Mount Sophia (currently known as Sophia Hills) for $1,157 psf back in September of 2013. It was mentioned by GuocoLand, who are also the developers of high-end residential projects such as Goodwood Residence, Wallich Residence and Leedon Residence, that the strategic location of the coveted Martin Place GLS site will prove to be great attraction to property buyers or investors. One biggest draw could possibly be its close proximity to River Valley Primary School, especially for parents of school-going kids. 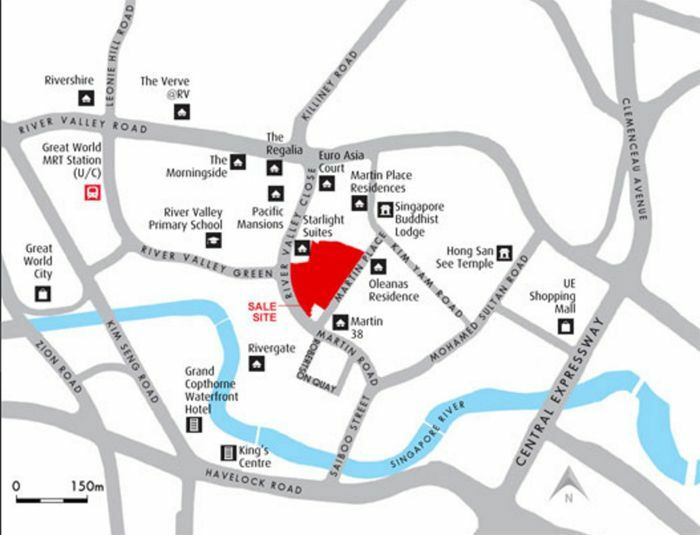 And not only it is located near Robertson Quay where you will find various F&B options, it’s also within walking distance to the upcoming MRT Station next to Great World City (part of the new Thomson-East Coast MRT Line) which will provide residents with easy access to the Central Business District (CBD) and Marina Bay Financial District. With a gross floor area of approximately 480,306 sqft, the 1.6ha site will be able to yield up to 450 units. A point to note is that part of the site has a height restriction of 20-storey in place, while the rest can go up to 30. Property experts estimate that the breakeven price for this future new launch project (to be named as Martin Modern) on the Martin Place GLS site will range between $1,800 to $1,900 psf. As a result, the eventual selling price may average around the $2,100 psf mark.